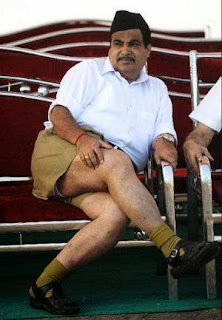 Nitin Gadkari made a shocking revelation that he used to pee in the lawns of his house. The house was once the office of Sonia Gandhi. Social media was in a buzz because of this revelation and the meme creators sprung into action. Tell me from your heart! Have you never peed on a pot of plant? I have done that to the cactus pots in my house when I was a child. I later presented those cactus pots to my maths teacher. My friend Rahul started making fun of Nitin Gadkari. Rahul is the kind of person who will stop every 5 kms and pee on the road side when we go for long trips. Apparently Rahul also had the habit of wetting his bed even in college hostel. He was 21 then. I am not sure whether he still has that habit. Rahul is a bachelor. To make the record straight, I am not talking about Rahul Gandhi. With many of my friends having their own organic garden, I thought of setting up my own organic garden in my terrace. But after hearing Nitin Gadkari's words, I have a doubt that some of my friends are urinating on the vegetables. Next time , you eat a vegetable, you might be eating a vegetable that was urinated on by some one. We might have heard the news that the late Morarji Desai had the habit of drinking his own urine. Many people in our country drink cow urine (Komiyam). I would not be surprised if Urine becomes a refreshing drink that is sold in containers and bottles in the near future. Imagine a 300 ml bottle of urine being sold for 10 bucks in the retail outlets. There will be a demand for urine in the market. Urine banks will be launched all across the country and many people will come forward to donate urine. We might even come across a point in future where "Urine Donation" might become a social cause and Corporates might invest in Urine donation as a part of their CSR strategy. When someone told that water will be sold in bottles, the people of my grand father's generation mocked at him. You might mock at me when I say that Urine will be sold in bottles. But you never know what you and your children might be drinking in the days to come. Just like the Marine Technology course that is offered as a professional course in colleges, Urine Technology might evolve as a BE course. People with BE in Urine Technology might get onsite offers and might become the most eligible bachelors in town. Did you see the tummy of Nitin Gadkari? People with pot bellies will be the most handsome men in future. The bigger the pot, the more the Urine. Unfortunately, the author of this blog has a flat tummy. The person in the above picture is Nitin Gadkari and not Sharon Stone.